Wheel alignment (sometimes called tracking) is an important piece of car maintenance that ensures your car’s wheels are giving their best performance in terms of handling, fuel economy, ride comfort and even tyre life. Thanks to advances in the technology used to measure wheel alignment, a computerised alignment can have your wheels back to the precise positioning that they were when they left the factory, and our standard wheel alignment use lasers to ensure a good alignment for your car. Why does my car need a wheel alignment? A car’s wheels go out of alignment from everyday use, but knocks and bumps caused by potholes or ‘curbing’ your car can have an immediate effect on your car’s tracking. Even though you might not immediately notice the effect to your car, even having wheels that are misaligned by a small amount can have an impact on your car’s fuel economy and tyre wear, however the further out of alignment your tracking is, the more noticeable the impact will be. While the two are often confused, wheel alignment is not the same as wheel balancing. Wheel alignment dictates the angles at which your car makes contact with the road. 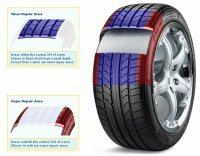 For the best performance you ideally want to have as much of the surface area of the tyre to be in contact with the ground as possible. If you would like to know more about any of our products or services please visit our contact page to leave us your details and we'll get back to you as soon as possible.